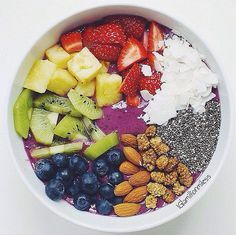 While I was scrolling through Instagram the other day, I saw multiple posts that had a beautiful bowl of fruit, nuts, and seeds and it was all lined up so perfectly. I had never heard of this? 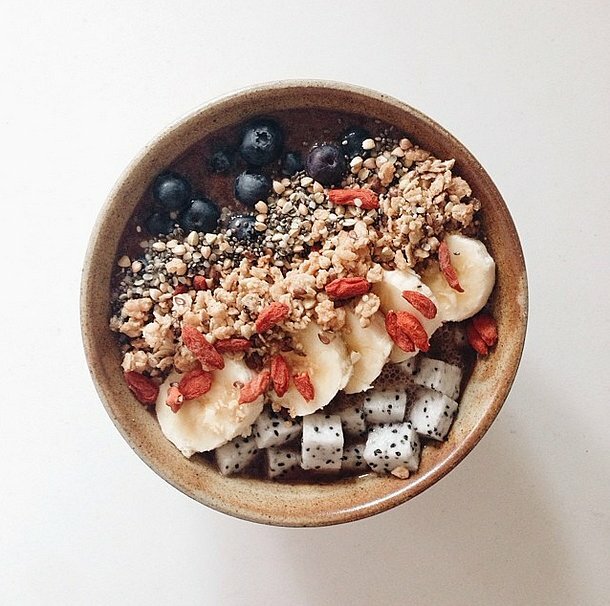 Acai Bowls? What? So I did some research, and I’m still not really sure. But, now I know that it’s a smoothie in a bowl and it comes from acai fruit. Well actually, I guess that’s all there is to it. But it still sounds difficult and a lot of work to just eat it when you’re done. This breakfast is from Brazil. The frozen puree of acai fruit is sold here in the U.S., but only in certain whole foods stores, or online. If I have to order food online to be delivered in the mail, that’s too much. Also I’ve read that it’s hard to get the acai to the right consistency. Scoopable, but no chunks. Sliced fruit. Kiwi, strawberry, banana, passionfruit, or anything! Honey or Agave for natural sweetener. There are endless possibilities for toppings. Also, it’s pronounced a-sigh-ee. Don’t worry, I was saying it wrong too.